LXstudio is 3-way loudspeaker that combines the LXmini with two LXsub4 dipole woofers. It requires addition of two 200 W or four 50 W power amplifiers and a miniDSP 4x10HD unit to form a system that covers the 20 Hz to 20 kHz frequency range with excellent clarity and dynamism. 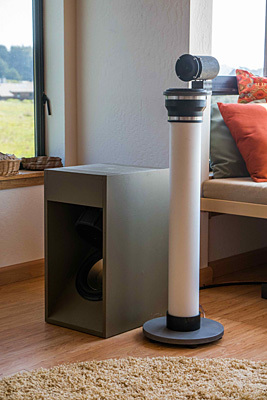 With an LR2 crossover at a low 60 Hz, the dipole woofers can be placed against the side walls of a room and the LXmini used as near-field monitors. Path length differences to the listener can be compensated for in the DSP unit. Dipole woofers have the advantage of less room mode excitation, Dipole woofers have the advantage of less room mode excitation and thus preserve articulation in bass sounds, which matters even in a highly damped recording/mixing studio. LXstudio is a speaker that is on par with the LX521.4 in terms of frequency range, clarity, imaging, sound stage size, dynamics and disappearance, albeit at somewhat lower maximum sound levels in the midrange and above. It is more flexible in room placement and woofer setup. LXstudio provides precise and highly revealing rendering of stereo recordings. LXmini Construction Plans + LXsub Construction Plans. If you already own the LXmini plans, then you only order the LXsub plans from plans, CDs downloads (or navigate to magicLX.com or Madisound). The LXsub Construction plans contain information for building LXsub2 and LXsub4. I provide Owner Support pages for updates to the LXmini and LXsub. 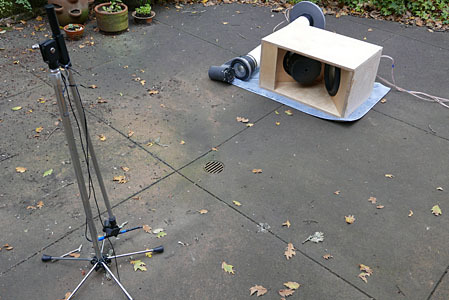 The pictures below show an outdoor frequency response measurement of LXmini and LX521 dipole woofer. It is part of the LXstudio design to achieve proper addition of the two outputs through the crossover region. The addition depends upon the frequency dependent magnitude and phase shift of the LXmini contribution and the LX521 dipole woofer contribution. 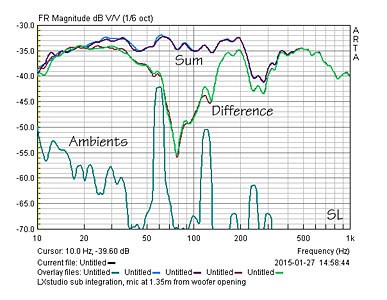 Ideally they are in-phase and add to a flat response as LXstudio and dipole woofer output magnitudes vary due to the LR2 crossover filter used. The difference response indicates how the outputs of changing magnitude subtract. If the magnitudes are identical and 1800 out-of-phase an infinitely deep notch should be seen. The measurement is perturbed by environment reflections and power line harmonics. The sum and difference traces give a good indication as to how well the two output signals add in-phase and with correct magnitude.